Garden of Aaron: Strawberries Must Go! 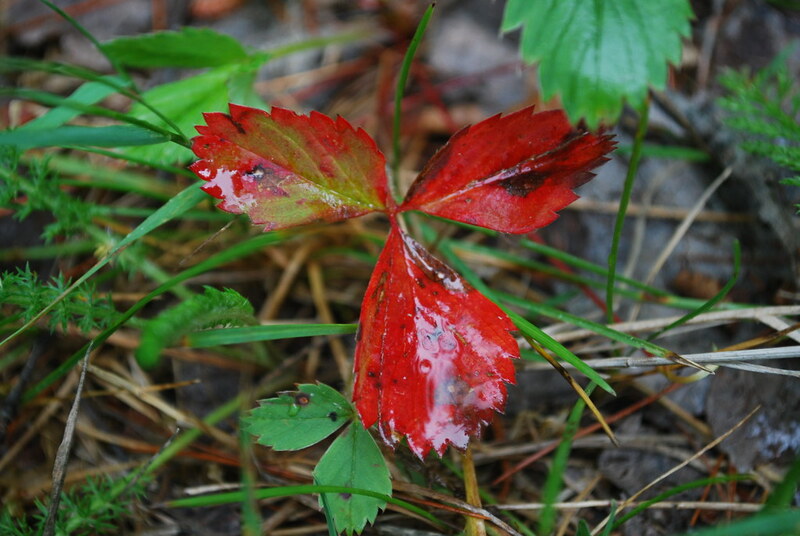 Wild strawberry (Fragaria virginiana) doing what it does best - covering ground. I thought that I had it all figured out. But that's what gardening is good at -- Just when you're feeling cocky, it pulls the rug out and shows you who's boss. 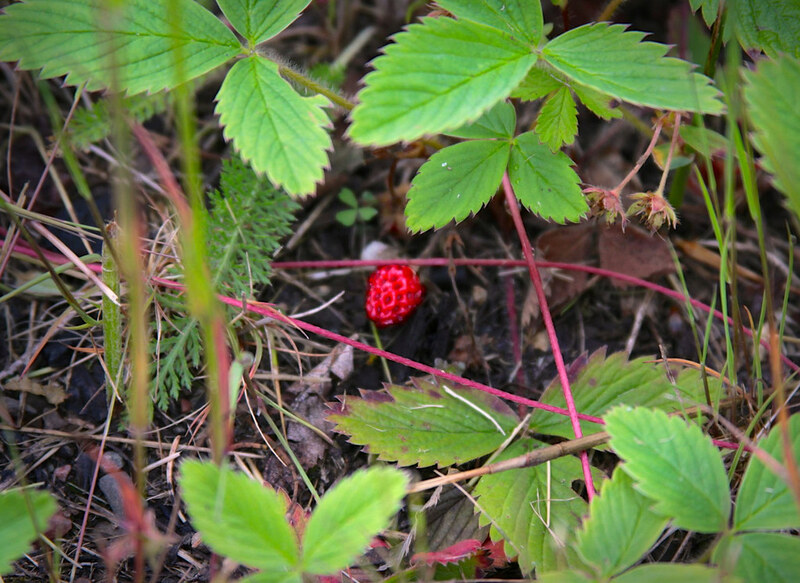 At first, I thought wild strawberry (Fragaria virginiana) would be the answer to my prayers. I've been searching for a tough groundcover (ideally native) that would cover all the bare dirt in my beds, block weeds and provide a beautiful green backdrop for all the other perennials, shrubs and trees in the garden. 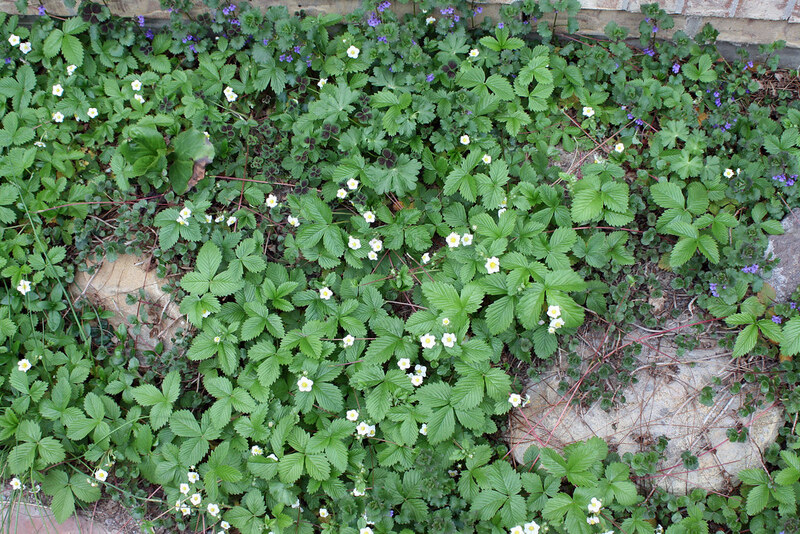 Wild strawberry definitely excels in the fast groundcover category - like 10-feet-in-every-direction-in-a-single-season fast. Of course, I should have known better. Just like canopy trees planted next to a house foundation don't stop growing when they hit 10-feet tall, a rampant groundcover doesn't stop expanding when it hits the end of a bed. In the case of a plant like wild strawberry that throws out long above-ground stolons, it just starts gunning for the lawn or sprawling onto the patio, the sidewalk, the driveway, etc. Once I realized it would be a daily (hourly?) chore to keep it in bounds, I decided to remove it. Since then, I've spent hours and hours trying to evict wild strawberry from the garden. I know it's a native here (though I don't remember ever seeing it in the wild). And it's probably a lovely plant in the right circumstances, but I just couldn't keep up with it here. For those who are wondering, it also didn't yield much fruit. A chipmunk (or chipmunks) got most of the fruit it did produce. And contrary to the rhapsodies you find on the Internet, I did not find the taste of wild strawberry fruit particularly impressive. In fact, I'd say that market hybrid strawberries are much sweeter and juicier. But I might have picked my wild strawberry too soon. I was pretty sure that if I waited another day or two, a critter would beat me to the punch and I wouldn't get to taste it at all. So where does this leave me in terms of groundcovers? - Coelestinum conoclinium (blue mistflower). I know some readers might feel that I'm too picky, that I want it all. Can't I just give up this wild goose chase and blanket my beds in wood chips, compost or pine straw like everyone else? Nope. Not yet. I haven't given up hope quite yet.